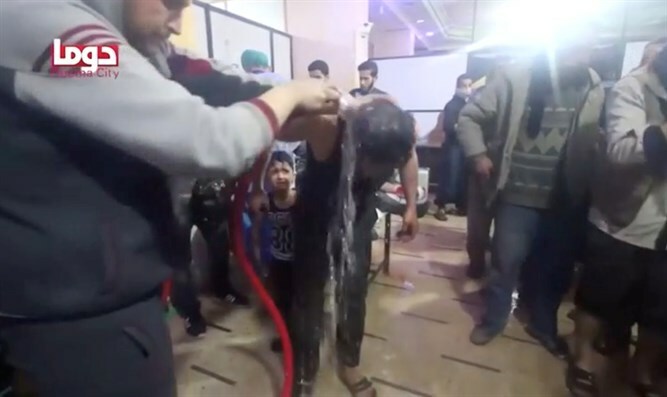 Organization for the Prohibition of Chemical Weapons determines chlorine was used in deadly attack on the town of Douma in April 2018. Chlorine was used in a deadly attack on the Syrian town of Douma in 2018, the world's chemical weapons watchdog determined Friday, reports AFP. The report by the Organization for the Prohibition of Chemical Weapons (OPCW) said two cylinders containing the poison gas landed on a housing block in Douma in April. Western powers led by the United States have blamed the regime of Syrian President Bashar Al-Assad for the attack and unleashed air strikes on military installations in response. The Syrian regime repeatedly denies having any connection to chemical weapons attacks in Syria. The Hague-based watchdog said in a statement on Friday that there were "reasonable grounds that the use of a toxic chemical as a weapon has taken place on April 7, 2018. "This toxic chemical contained reactive chlorine," it said according to AFP. The findings confirmed an interim report released last July, in which local sources quoted by the OPCW said at least 43 people were killed in the attack. The watchdog said it found no evidence of the use of nerve agents in Douma, which had been previously alleged by some parties in the conflict. The report does not place blame because it was not in the OPCW's remit at the time, although the watchdog has since been given powers to investigate responsibility for all chemical attacks in Syria back to 2014. Russia, which backs the Assad regime, rejected the OPCW report, saying that it was "staged" by Syrian rescue volunteers known as the White Helmets. "In spite of all the evidence presented by Russia, Syria, and even British journalists that the Douma incident is no more than 'White helmets' staged provocation, Technical Secretariat of OPCW states in today's report that chlorine was used in Douma as a chemical weapon," the Russian Embassy in The Hague tweeted. Russia has in the past accused Britain of staging the Douma attack. A team of OPCW inspectors took more than 100 samples from some seven sites in Douma when they gained access to the town several weeks after the attack. It said it reached its conclusions based on "witnesses' testimonies, environmental and biomedical samples analysis results, toxicological and ballistic analyses from experts". The report said "two yellow industrial cylinders dedicated for pressurized gas" were found at the scene, one of which had landed on top of the housing block and crashed through it. It said it was "possible that the cylinders were the source of the substances containing reactive chlorine." The OPCW said witnesses reported to the inspection team that there were "43 decedents related to the alleged chemical incident, most of whom were seen in videos and photos strewn on the floor of multiple levels of an apartment building and in front of the same building." The watchdog also rejected claims by the Syrian regime that the gas had come from an alleged rebel chemical weapons facility and storehouse in the area, which inspectors were allowed to visit. "From the analysis of the information gathered during the on-site visits to the warehouse and facility suspected of producing chemical weapons, there was no indication of either facility being involved in their manufacture," it said.